NEW MUSTARD WAY OF LYING TO THE INFIDEL AND TO OTHERS: ……..TAWRIYA! – The Tundra Tabloids……. 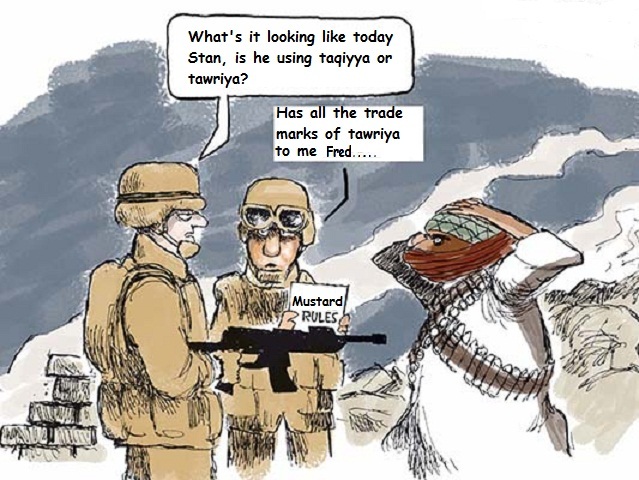 NEW MUSTARD WAY OF LYING TO THE INFIDEL AND TO OTHERS: ……..TAWRIYA! Always serving up new ways to trick the non-believer. It’s all legalized lying no matter which way you slice it. The Islamic ideology is the most fake moral code ever invented. The authoritative Hans Wehr Arabic-English Dictionary defines tawriya as, “hiding, concealment; dissemblance, dissimulation, hypocrisy; equivocation, ambiguity, double-entendre, allusion.” Conjugates of the trilateral root of the word, w-r-y, appear in the Quran in the context of hiding or concealing something (e.g., 5:31, 7:26). As a doctrine, “double-entendre” best describes tawriya’s function. According to past and present Muslim scholars (several documented below), tawriya is when a speaker says something that means one thing to the listener, though the speaker means something else, and his words technically support this alternate meaning. For example, if someone declares “I don’t have a penny in my pocket,” most listeners will assume the speaker has no money on him—though he might have dollar bills, just literally no pennies. Likewise, say a friend asks you, “Do you know where Mike is?” You do, but prefer not to divulge. So you say “No, I don’t know”—but you keep in mind another Mike, whose whereabouts you really do not know. All these are legitimate according to Sharia law and do not constitute “lying,” which is otherwise forbidden in Islam, except in three cases: lying in war, lying to one’s spouse, and lying in order to reconcile people. For these, Sharia permits Muslims to lie freely, without the strictures of tawriya, that is, without the need for creativity. Previous Post Previous Post MYTH BUSTERS DISTRIBUTION OF WEALTH EPISODE: SOCIALISM 101……. Next Post Next Post BAD TIME TO BE A BLACK MAN IN LIBYA…….